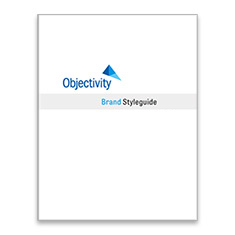 Please find logo, image, and color guidelines that are specific to the Objectivity branding style guide. Objectivity logos and other brand guidelines may be used or reproduced by following these instructions and adhering to them at all times. Use the Objectivity Brand Guidelines for more info on clearspace guidelines, logo variations, partner logo placement guidelines, and fully documented CMYK, RGB, HSB, and Pantone Corporate Color Chart.